Note: This article originally appeared in the May/June 2011 issue of TDSN News. triangledownsyndrome.org. Leerlo en español. We have a motto at our Center: Play is the Brain’s Way of Learning. Play allows the brain to learn about objects, events, and relationships of the child’s world. Play helps to develop knowledge about spatial-temporal-causal relationships. Play also has a symbolic purpose where the child develops an imagination, creates stories, and applies thinking with reasoning skills. To many, Play is the precursor to language, at least the enhancer of social- symbolic-communication. This is why Play is such an important part of development. Pre-symbolic stage: At the early stage of play, often referred to as the pre-symbolic stage (around 8 -12 months for typically developing children and 16 – 24 months for children with Down syndrome), the child acquires object permanence (child knows that an object exists when not seen), cause-effect relations (child knows that completing an action will result in a goal, e.g., turning the handle opens the door, pushing the button turns on the T.V., pulls string to get a toy), and object use (child begins to explore toy parts, does not mouth toys instead turns, bangs, throws, etc). These Play activities aid the child in communication by increasing joint attention, gesturing to share or to request, and for commanding. Many young children we see have not developed this stage. This is why we introduce object permanence, cause- effect, and object use, during the early treatment sessions. Play at this stage includes wind up toys for cause-effect; playing hide-n-seek for object permanence; and allowing the child to explore and play with toys by touching, taking them apart, moving, banging, dropping, etc. We encourage gesturing by having the child make choices, signing when the child is finished, and develop turn-taking skills for social exchange. Pre-symbolic later stage: This stage occurs about the time a child is beginning to use single words: around 13 – 17 months for typically developing children and 24 – 30 months for children with Down syndrome. At this stage, the child will go and seek a toy to play with, like in another room or in a closed toy box. S/he also will hand the toy to an adult if they can not get it to work. The child will now point to pictures and objects which is an important joint-attention activity. The child understands parts of toys and begins to build with blocks, put an object into another object like putting a figure in a car. 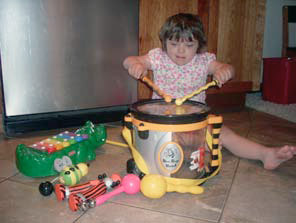 Communication, at this stage, consists of single words while the child is interacting with the toy, such as, the child saying “ball” when throwing it, or “car” when riding, or “cookie” when reaching for it. Social exchange now includes greetings, labeling, protesting, and responding to an adult’s request. 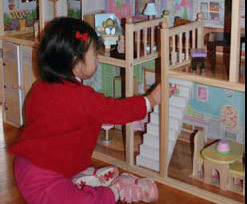 Developing play at this stage should include anything that requires a shared activity, such as, throwing the ball back-and-forth, pushing a wagon with a doll inside, building towers and knocking them down, putting blocks into a container, matching a picture to another one out of a set of four, and interactive stories with flaps to open exposed pictures. Early Symbolic stage: Researchers and linguists describe this stage as being the point at which the child has internal mental representation. This means the child can now think with language. The child reasons, can make adjustments, and can problem solve. It occurs around 17 – 19 months for typically developing children and around 30-36 months for children with Down syndrome. We think of this as the pretend stage. Here the child pretends to play tea-party, feeds a stuffed animal with toy foods, uses a stick as a sword, and dresses up as mom or dad. The child is a little actor who pretends to sleep, pretends to be angry, or pretends to fix a meal like making pizza. Communication is expanding at this age: here the child now understands more than 100 words, as well as speaks and signs 15 – 20 words. He recognizes family names, may say “no”, likes to listen to stories, and frequently acknowledges others through eye contact. Obviously, play activities at this stage should encourage more pretend play, social interaction, and reasoning. Symbolic stage: At this stage the children begin to combine words together. It usually occurs around 19 – 22 months for typically developing children and 36 – 42 months for children with Down syndrome. Pretend play is now an expansion of the previous stage; for instance, pretend feeding may occur, with more than one person (i.e., self, mom, doll, another child. ), or the child may combine two actions with one toy, like patting a doll and putting it to bed. Two word combinations now associate the play activity with labeling; for instance, the child may say “throw ball” (i.e., the action word with the object), request a location, like “there ball”, or ask a simple question “where daddy?” Encouraging more realistic pretend play activity is important at this stage, such as, having a drawer in the lower kitchen cabinets filled with cooking utensils so that the child can pull them out to pretend to cook while mom or dad is preparing the meal; having the child help set the table; getting the child’s stuffed animal ready to go for a car ride; taking turns during a simple board game, etc. We highly recommend working on early phonics and acquiring the alphabet at this stage. Daily joint-book reading at this stage is also important. Later Symbolic stage: During the later symbolic stage, children are using phrases and short sentences to communicate, around 24 months for typically developing children and 42 – 59 months for children with Down syndrome. We think of this stage as the language building stage. Here children begin to use the “ing” with verbs, use articles, plurals, possessives, pronouns, and will ask simple questions. They also talk about recent experiences, such as, going to the play ground, going shopping, or visiting the doctor. Play activities at this stage encourage memory, reasoning, planning, and verbal exchanges. 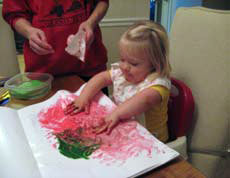 For instance, helping the child locate two similar pictures out of a five-by-five display; driving a truck on a floor map with streets; figuring out what happens when the child mixes red and blue paint together; feeling objects in a dark bag for texture, shape, and size; and establishing a routine where the child has to tell the adult what to do. Other activities might include cutting out action pictures from magazines and having the child describe them with complete sentences. The adult can expand on the child’s utterance so that the next time, the child will include the expansion of the descriptions. You can take pictures of your child eating, sleeping, jumping, climbing, running, crying, laughing, blowing, etc. Place the pictures in a book so the child can go through them talking about what s/he is doing. Preschool stage: Obviously the preschool stage involves children who are 3 – 4 years old while children with Down syndrome are somewhere close to age 5 – 6 years old. We think of this stage as the child being a joint- communicator. That is, all of a sudden the child now can hold a dialogue with an adult. The child can initiate the conversation, respond to the parent, or even provide feedback during the discourse. The parent is less likely to ask what the child wants and infrequently tells the child what to say. Now the child comes to the adult and tells them what they want. They also develop play scripts for their dolls and puppets to act out. They make up pretend stories. Language structure contains full and complete sentences, compound nouns, and compound objects. They use adjectives and some adverbs. They will have some sight words and know most of the letters of the alphabet. Half of the children, at this stage, recognize their written name. They can count and associate numbers 1 – 4. Developing play activities, at this stage, should include retelling stories that were just read. Use visual props to help retell the stories. Use hand puppets, cut out face figures, “little people”, and other material for imaginative play. Help the child predict out comes or future events. For instance, stop in the middle of a story and ask the child what s/he thinks is going to happen on the next page. Ask the child what they think would happen if the story was different; for example, if Goldilocks did not run away. Ask the child what would happen if the character was different; for instance, if Biscuit was a cat and not a dog. Have the child change their voices when play acting. For instance, you could have the child use a high voice for a baby, normal voice for the child, mother voice, and a low voice for the daddy. So, please remember to watch your child, teach your child to play, and keep playing with them.